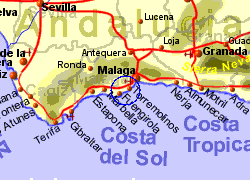 Now virtually absorbed into Benalmadena but retaining it's own identity, Arroyo de la Miel is a modern small town, set just back from the coastline, on the Costa del Sol approximatley 25Km south west of Malaga city. It is the location of the Tivoli World them park, and also the Telecabina cable car which takes passengers up Mount Calamorro to an altitude of around 650m, giving impressive views of the coastline. There is a good path down from the top of the cable car for those who want a slower journey down (the cable car takes around 10 minutes). There is of course a good selection of bars, restaurants and shops in Arroyo de la Miel. 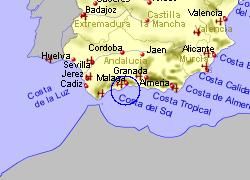 Map of the Arroyo de la Miel area. This 2 bedroom apartment with swimming pool is located in Jarales - Algaida - Mi Capricho and sleeps 4 people. It has air conditioning, a garden and parking nearby. The apartment is walking distance away from golf and beach. This 2 bed, 2 bath apartment is perfect for a family holiday, a winter long let or a golfing break in the sun. No detail has been overlooked and the large terrace has comfortable table and chairs. The kitchen is fully fitted and well equipped with everything that you might need. The living room and diner has been furnished to a very high standard. Luxury villa on own landscaped grounds with private pool, situated near the golf, 5 minutes from Fuengirola's beaches and a 20 minute drive from Malaga Airport. This lovingly furnished holiday home is located just 700 metres from some of the most scenic beaches along the coast. It has been stylishly and tastefully decorated throughout and features spacious living areas, which are great spots for socialising with family or friends. Guests in this Spanish villa will benefit from three bedrooms, two bathrooms, a fully-equipped kitchen and living area, as well as fantastic terrace area. The outside swimming pool is brilliantly refreshing on hot summer days. Holiday villa in Mijas for rent. Sleeps 10. 5 bedroom Villa, with air conditioning and Private Pool & free wi-fi. This beautiful large 5 bedroom detached villa, electric gated property, offers sensational views of the countryside. The villa is situated 2kms outside of the heart of Alhaurin El Grande Town where there is a wide choice of bars, restaurants and coffee shops to enjoy. As well as the local supermarkets.